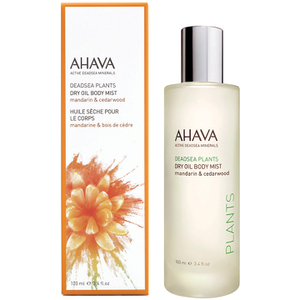 Reignite a healthy glow with the AHAVA Mandarin and Cedarwood Dry Oil Body Mist; a lightweight, non-greasy spray developed to soften, smoothen and restore luminosity. Infused with Jojoba and Sesame Seed Oils, the luxurious formula inspires all-over radiance, whilst antioxidant Vitamin E and Dunaliella Algae defend against environmental aggressors. Envelops the body with Dead Sea plant oils and an uplifting fragrance of Mandarin and Cedarwood.